I was very kindly given the chance to review a fantastic product from the lovley site notonthehighstreet. 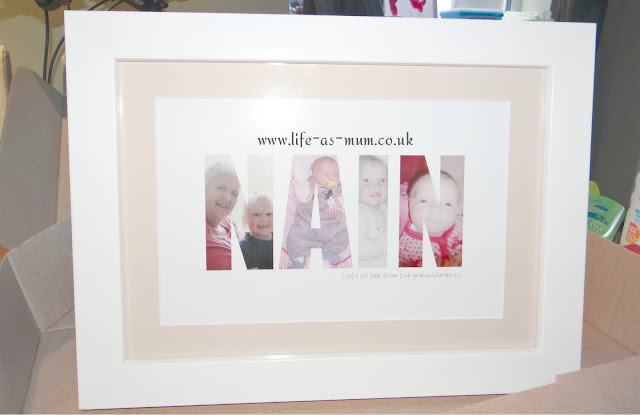 I chose the 'Personalised Framed Grandma Photograph Print'. I thought it would make a lovely gift for my nain who will be 70 in October. I can not wait to give it too her! You can choose any word you want such as Nain, Grandma, Nan, Nanny or whatever you call your grandmother. Which i think is great because most of these shops and online sites don't let you have a choice It's either Grandma or Nana mostly. Lovely way to make it very personalised for a special person. You can also have these done in Mam, Dad or Brother etc! You get too choose an A4 or A3 size! You get too choose which frame, size and colour of mount you want which is fab! I chose the white wooden frame with the mushroom coloured mount. I chose 4 pictures - one of my Nain and my eldest daughter Mia one where Mia was newborn, One where Elliw was newborn and the other of Elliw recently. I thought it was nice having a mix of old and new pictures! Delivery was very fast and parcel was very wrapped up safely. Overall - I really do love this product and i do think it is worth the money. It makes it very personal for either your self of the person you are buying it for. Lovely thing to have on the wall i think!